US stock market advance continued Tuesday with consumer discretionary in the lead. The S&P 500 ended 0.2% higher at 2786.85. Dow Jones industrial average however slipped less than 0.1% to 25320.73. 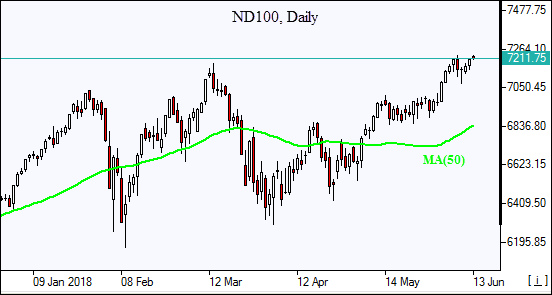 The Nasdaq composite index climbed 0.6% to 7703.79. The dollar strengthening accelerated: the live dollar index data show the ICE US Dollar index, a measure of the dollar’s strength against a basket of six rival currencies, rose 0.2% to 93.80 and is up currently. Stock index futures point to mixed openings today. With a rate hike widely expected investors are waiting to see if any changes are made to the dot plot, the policy makers projections for interest rates. Consumer price data showed inflation rose to 2.8% in May from 2.5% in April, in line with expectations. With expectations building that the US economic growth accelerates to above average 4%-4.5% and inflation data confirming economy is strong, there is a chance more policy makers may see the need for four rate hikes this year instead of three as indicated previously. The interest rate decision is due at 20:00 CET today, and at 20:30 CET starts Fed chair Powell’s press conference. European stock indices pulled back Tuesday while Italian and Spanish stocks advanced. The euro joined British Pound’sslide against the dollar and both currencies are receding currently. The Stoxx Europe 600 slipped 0.1%. The German DAX 30lost less than 1 point to 12842.30. France’s CAC 40 fell 0.4% and UK’s FTSE 100 lost 0.4% to 7703.81. Indices opened mixed today. Markets got little support from weak economic data: German economic sentiment in June dropped to the lowest level since September 2012, according to the German ZEW think tank. Weekly earnings excluding bonuses rose 2.8% in the three months to April in UK when a 2.9% rise was expected. Asian stock indices are mostly lower today despite a joint statement by President Trump and Kim promising in to work toward the “denuclearization” of the Korean Peninsula. Nikkei gained 0.4% to 22966.38 as the yen slide against the dollar persisted. Chinese stocks are falling: the Shanghai Composite Index is down 1% and Hong Kong’s Hang Seng Index is 1.1% lower. Australia’s All Ordinaries Index is down 0.5% with Australian dollar edging lower against the greenback. Brent futures prices are extending losses today as supply is seen rising both in US and OPEC. The American Petroleum Institute reported late Tuesday that US crude inventories rose by 830,000 barrels to 433.7 millin. Prices ended lower yesterday: August Brent fell 0.8% to $75.88 a barrel Tuesday. Today at 16:30 CET the Energy Information Administration will release US Crude Oil Inventories.